© Estate of Wallace M. Mitchell. Photograph by John Seyfried. Director of Cranbrook Academy of Art Galleries from 1955 to 1971 and president of the Academy of Art from 1970 until his death in 1977, Wallace Mitchell continued to paint as he carried out his duties as administrator. Mitchell had become deeply rooted in Cranbrook. After studying painting with Zoltan Sepeshy for a year, he was hired to teach drawing and painting at the Academy. 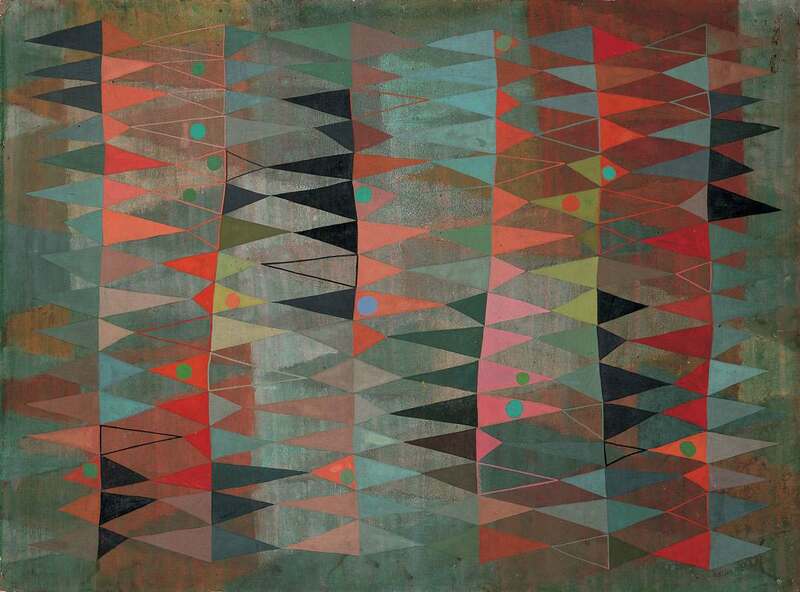 While his work in the 1930s was figurative, he turned to abstract art and geometric forms in the 1940s, perhaps in part due to his friendship with Harry Bertoia, who worked with geometric forms at the same time. Mitchell’s paintings gained national attention when four of his abstract works were acquired by the Guggenheim Museum. In Double Pennants, the color modulates from warm orange-reds to cool pinks with olive-green accents. The pennants undulate in soft waves as if in changing light, with “eyes” animating some of them. Mitchell’s lively design and masterly use of color evokes the spatial depth of the sea.